Lime Green Black Navy Chocolate Hot Pink Aqua"
This travel Garment bag is lightweight and easy to clean. A 3.5 inch clear gusset in this travel garment bag allows generous space for many dresses or suits and the frameless construction makes this bag easy to fold. 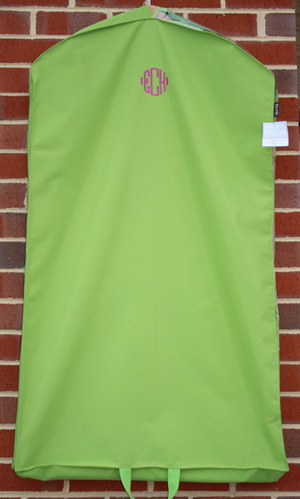 Monogrammed garment bags make the perfect bridesmaids, groomsmen, graduation, or birthday gifts!